Table Top Display - 2 Panels, lightweight & durable with 360 degree folding METAL hinges that never wear out! Table Top Display Board, 2 panel, diptych, 30w x 40h" individual panel size, opens to 40h x 60w" in black VELCRO®. $339. (459 Velcro on both sides). Total weight of tabletop display is 8 lbs. Optional, Portfolio case, $169, Graphic 7 x 30" header panel, $89, slips on in seconds. Stack one on top another to make an 80"h x 60"w floor standing exhibit. ANY SIZE, portable Table Top Displays are built to order in any of two-, three-, four-, five- or more panel combinations. 360-degree folding metal hinges are a more durable, stable alternative to flimsy fabric hinges that most companies use and allows your tabletop display to be configured into any shape or size. 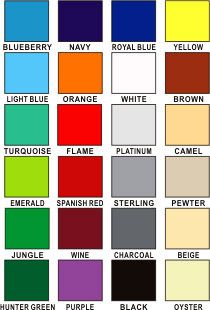 100 COLORS of VELCRO® brand loop fabric bonded to one or both sides of table top display boards. Tabletop displays are lightweight, with fabric securely bonded to foam board on interior frame and wrapped over edges around to back. 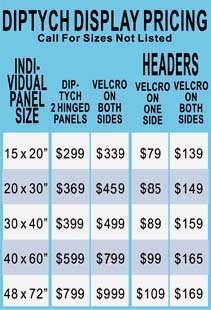 GRAPHICS for entire table top display board, printed, laminated and backed with VELCOIN® fasteners, $299. Order with canvas case, $249 or Polytuff shipping case with wheels $559. TABLE SKIRTS with or with out logo imprinted. Table top displays easily travel to presentations, meetings and tradeshows. Ships out in five business days; rush services available. See CUT AWAY CROSS SECTIONS, table top displays, gallery, all displays or request info and for in house art dept. contact our experienced staff.